The Wheel of Death is a 6 ft diameter wheel that spins with a skeleton tie to it. This is a big display and requires a lot wood to construct and a powerful motor to drive it. Because this project is so big the results that you will get from your guests will also be big. 3. Scrap 3 x 1 pieces about 12 inch long each. 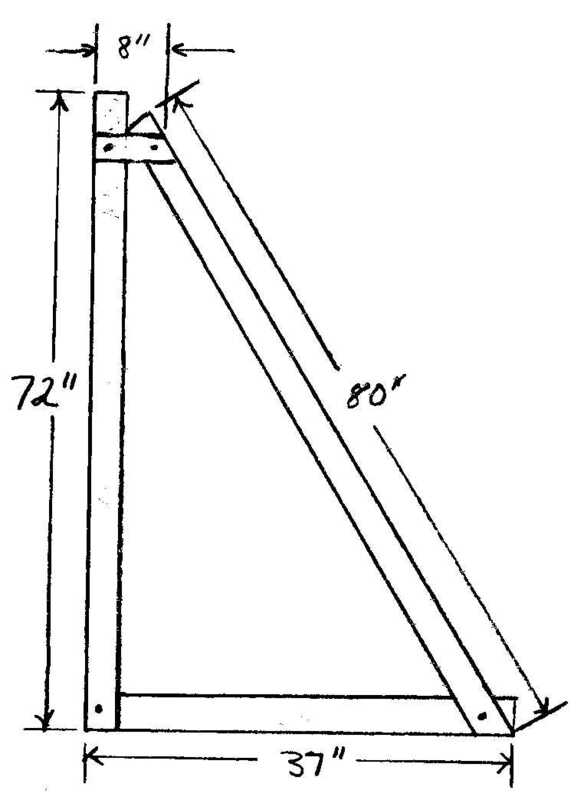 The construction of the frame is two triangles made up of 2 x 4. To make a triangle you need 3, 2 x 4 pieces. The first piece make 72 inches, the second piece 37 inches long ,and the third piece make 80 inches long. You need to repeat this step twice to get two triangles total. Use a scrap piece of wood 8 inches long to connect the top of the triangle together. 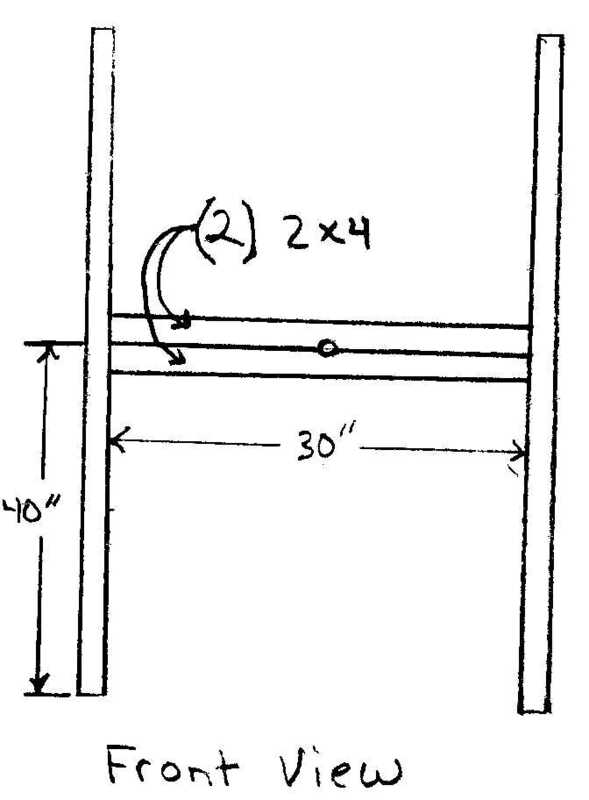 To connect the two triangles together you will need 2 pieces of 2 x 4 that are 30 inches long. These will be screwed to the center of the 80 inch long side so it looks like a 2 x 8 when you screw the 2 x 4 up against each other. You then want to drill a hole in the center of the 2 x 4 and this center will be where the wheel will rotate. The center hole should be the size of the shaft you are using in this case we are using 5/8 inch. Take one of the ball bearings and attach it to the inside of the triangle frame where you just drilled the 5/8 hole. This will help support the weight of the shaft. To construct the big wheel you will need two full sheets of ½ inch plywood. Lay both pieces out on a level surface so that they are against each other to form one big sheet. Next you want draw a 6 foot diameter circle on the plywood. The center of the wheel should be located where the two pieces of plywood meet. Make sure you clearly mark where the center of the circle is before you cut. After you cut out the circle attach the two pieces together with some scrap 3 x 1 and screw them in along the seam and make sure you space out the scrap wood evenly this will be important later on when you add a support wheel. Drill a 5/8 hole in the center of the wheel. Next you want to take some scrap ¾ inch plywood and cut out to square 4 inch pieces and screw them together to make a 1 ½ inch thick square piece. Drill a 5/8 hole through the center of the square and you also want to drill a ¼ inch whole through one of the edges so that it goes through the center of the 5/8 hole. This hole will be used for a pin to lock the shaft to the big wheel. Attach the square block to the front of the wheel making sure that the 5/8 hole lines up with the other 5/8 hole on the big wheel. To attach the wheel to the lazy susan you want to use 4 bolts, washers, and locking nuts. You can also lay the support triangle down to have big wheel sit level on the lazy susan that way you don’t have to hold the big wheel up. You may need to drill the holes larger on the lazy susan to fit the bolts. You want to make sure to line up the center of the wheel with the lazy susan. You can insert the shaft through the big wheel and all the rest of 5/8 holes to help get the wheel aligned properly. Once you have the wheel aligned mark the wheel where the holes are for the lazy susan, then drill the ¼ inch holes for the bolts. Next, attach a support wheel to the triangle frame to support the bottom portion of the wheel but do not tighten the bolts yet. See if the wheel spins and if the wheel is hitting any part of the triangle support you want to add a small wheel at the bottom of the large plywood spinning wheel to stop any obstructions from spinning. When attaching the wheel make sure that it doesn't hit any of the blocks of wood holding the wheel together as it spins. You may have to remove a couple of blocks and reposition them to do this. Once you have the wheel rotating freely you need to attach the shaft to the wheel. You need to drill a ¼ inch hole in one end of the 5/8 rod this is for the locking pin to lock the wheel to the shaft. Once the hole is drilled, slide the rod in making sure that the hole in the rod lines up with the hole in the 4 inch square block. Use a 4 inch long ¼ inch bolt to lock the rod to the wheel. At the other end of the rod you can now attach the 6 inch V-belt wheel. You can also attach the smaller V-belt wheel to the shaft of the motor. To attach the motor to the triangle frame we need to make a support for it. The distance between the motor and the big wheel will depend on how long you V-belt is. When making up a motor frame make sure the frame is at the same angle as the V-belt wheel on the big wheel. This will keep the V-belt from slipping off both wheels. Take a look at the picture to get an idea on how to build a support for the motor. Once you play around with the positioning of the motor you can attach something to the front of the wheel. Whatever you put on your wheel make sure that the weight is distributed over the whole wheel. This way it will put less stress on the motor. Also painting your Wheel of Death can be done to give it that personal touch.